And it uses an electron/mouth acid reaction to kill disease-causing bacteria and breakdown plaque instead of toothpaste. Very cool indeed, but I’m curious how the dental hygiene industry will react to the device? Dr. Kunio Komiyama, a dentistry professor emeritus at the University of Saskatchewan, designed the first model of the unconventional toothbrush 15 years ago. Today, Komiyama and his colleague Dr. Gerry Uswak are seeking recruits to test their newest model, the Soladey-J3X. The toothbrush, which is manufactured by the Shiken company of Japan, will soon be tested by 120 teenagers to see how it compares to a normal toothbrush. The Soladey-J3X has a solar panel at its base that transmits electrons to the top of the toothbrush through a lead wire. The electrons react with acid in the mouth, creating a chemical reaction that breaks down plaque and kills bacteria. The toothbrush requires no toothpaste, and can operate with about the same amount of light as needed by a solar-powered calculator. And these things can be applied to solar installations in the field. Talk about a simple improvement that goes a long, long way. Solar efficiency tends to go up in tiny increments unless it involves some sort of materials or process breakthrough. This news really is impressive. 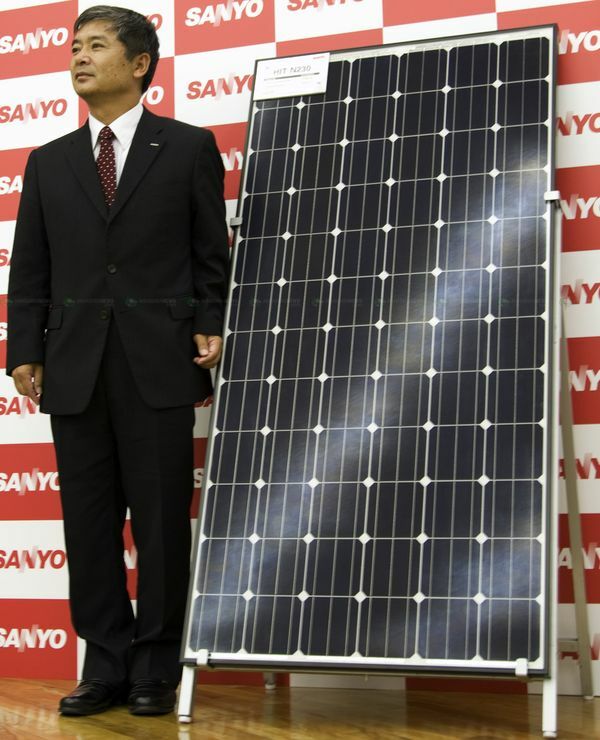 The power output of solar panels can be boosted by 10 percent just by applying a big transparent sticker to the front. Developed by a small startup called Genie Lens Technologies, the sticker is a polymer film embossed with microstructures that bend incoming sunlight. The result: the active materials in the panels absorb more light, and convert more of it into electricity. The polymer film does three main things, says Seth Weiss, CEO and cofounder of Genie Lens, based in Englewood, CO. It prevents light from reflecting off the surface of solar panels. 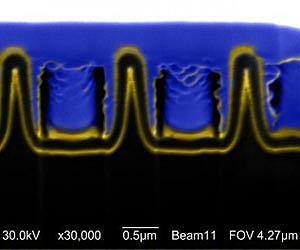 It traps light inside the semiconductor materials that absorb light and convert it to electricity. And it redirects incoming light so that rather than passing through the thin semiconductor material, it travels along its surface, increasing the chances it will be absorbed. Power film: A thin plastic sheet covered with microscopic structures is applied to the front of a solar panel to increase the amount of light it absorbs. Is solar power cheaper than nuclear? One of the issues associated with shifting from using fossil fuels to alternative energy sources is the cost. While adherents of alternative energy tout its benefits, many are skeptical, pointing out that such alternatives are just too expensive. Advocates of nuclear power point out that it is less polluting (if you don’t count storage of spent fuel) than fossil fuels, and that it costs less than alternatives like solar power. A new study out of Duke University, though, casts doubt on the idea that nuclear power is cheaper than solar power. Using information from North Carolina, the study shows that solar power may be more cost efficient than nuclear power. With costs dropping on the production of photovoltaic cells, and with solar cells becoming increasingly efficient, it appears that — in North Carolina at least — solar installations offer a viable alternative to nuclear power, which is the source for about 20% of the electricity in the U.S. I like the “anti-sunscreen” intro to this news on improving the efficiency of photovoltaic solar cells with selenium. College Park, MD (August 3, 2010) — Call it the anti-sunscreen. That’s more or less the description of what many solar energy researchers would like to find — light-catching substances that could be added to photovoltaic materials in order to convert more of the sun’s energy into carbon-free electricity. 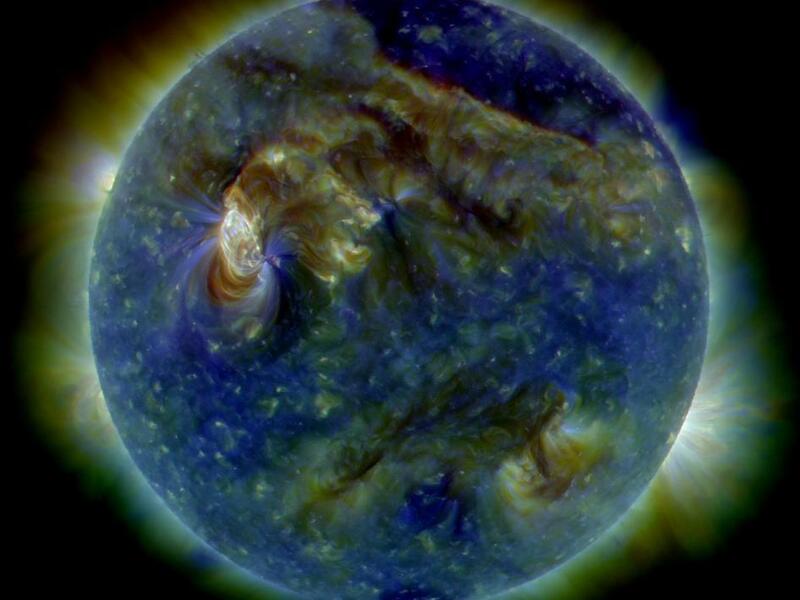 Research reported in the journal Applied Physics Letters, published by the American Institute of Physics (AIP), describes how solar power could potentially be harvested by using oxide materials that contain the element selenium. A team at the Lawrence Berkeley National Laboratory in Berkeley, California, embedded selenium in zinc oxide, a relatively inexpensive material that could be promising for solar power conversion if it could make more efficient use of the sun’s energy. The team found that even a relatively small amount of selenium, just 9 percent of the mostly zinc-oxide base, dramatically boosted the material’s efficiency in absorbing light. “Researchers are exploring ways to make solar cells both less expensive and more efficient; this result potentially addresses both of those needs,” says author Marie Mayer, a fourth-year University of California, Berkeley doctoral student based out of LBNL’s Solar Materials Energy Research Group, which is working on novel materials for sustainable clean-energy sources. Yesterday I blogged about a new solar energy process that might supplant photovoltaics, at least in large-scale desert installations because of dramatically increased efficiency. Today it’s a breakthrough with photovoltaic solar cells in regards to production cost. I like seeing all this innovation is the solar space, especially since it’s a bit all over the map. Incremental improvement is always nice, but anytime research is going after all sorts of targets the odds of a major breakthrough go up. One of the most promising technologies for making inexpensive but reasonably efficient solar photovoltaic cells just got much cheaper. Scientists at the University of Toronto in Canada have shown that inexpensive nickel can work just as well as gold for one of the critical electrical contacts that gather the electrical current produced by their colloidal quantum dot solar cells. The change to nickel can reduce the cell’s already low material costs by 40 to 80 percent, says Lukasz Brzozowski, the director of the Photovoltaics Research Program in Professor Ted Sargent’s group. They present their research in the July 12, 2010 issue of Applied Physics Letters. A completely new path to solar efficiency? Maybe so. And if so this sounds very promising. I’ll go ahead and repeat my solar energy mantra — two things both have to happen before solar is truly economically viable: costs must come down quite a bit, and the efficiency has to at least be within spitting distance of petroleum and other traditional natural resources. This sounds like very good news on the efficiency front. Might even offer some cost benefits as well. Called ‘photon enhanced thermionic emission,’ or PETE, the process promises to surpass the efficiency of existing photovoltaic and thermal conversion technologies. Good solar news. I may sound like a broken record, but for solar to be market-viable two things have to happen — costs must come way down and efficiency must go way up. This is a step in the right direction. Imec scientists realized large-area (70cm2) epitaxial solar cells with efficiencies of up to 16.3% on high-quality substrates. And efficiencies of up to 14.7% were achieved on large-area low-quality substrates, showing the potential of thin-film epitaxial solar cells for industrial manufacturing. The results were achieved within imec’s silicon solar cell industrial affiliation program (IIAP) that explores and develops advanced process technologies aiming a sharp reduction in silicon use, whilst increasing cell efficiency and hence further lowering substantially the cost per Watt peak. Sounds like a great idea to begin integrating solar energy into viable power production. The first ever hybrid solar-coal power plant is now operating at Unit 2 of the Cameo Generating Station near Palisade in Colorado. 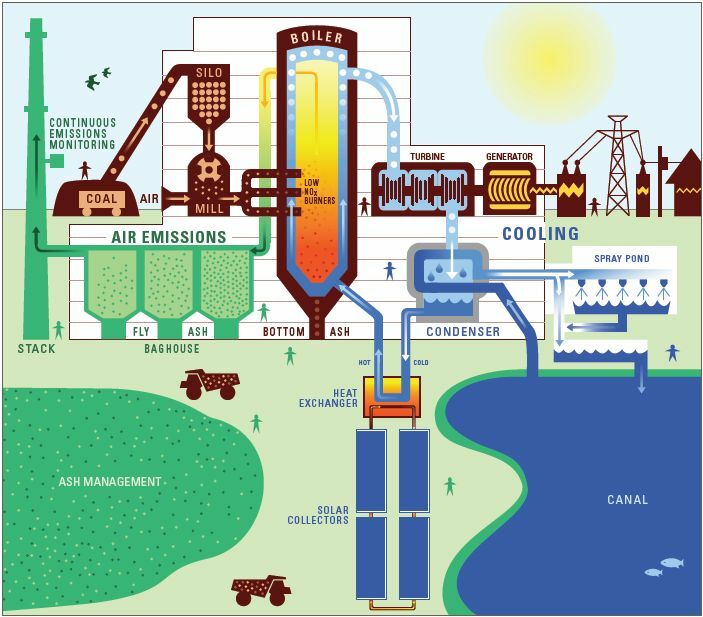 The demonstration project was built by Xcel Energy as part of its new Innovative Clean Technology (ICT) Program, and is designed to decrease the use of coal, increase the plant’s efficiency, lower carbon dioxide emissions, and test the commercial viability of combining the two technologies. The project was developed by Xcel Energy in conjunction with Abengoa Solar, which developed the solar parabolic trough technology that concentrates solar energy to produce heat. The demonstration project is expected to cut the use of coal at the power plant by around two or three percent, and could be scaled up to cut it by 10 percent. As a nation we must find energy sources beyond petroleum. Chiefly because it’s a finite resource and will eventually — and that eventually may be a long ways off — run out. And it is the root of almost every vexing military and statecraft problem the United States faces. The problem is oil, gas and coal are so incredibly cheap and efficient compared to any feasible alternative. Solar power has seen breakthrough after breakthrough (see the link in the sidebar under “interesting blog topics”) over the last several years, and many of these breakthroughs affect the current solar marketplace so it’s not all pie-in-the-sky activity. One way to ramp up improvements in solar efficiency and lower practical costs is to infuse the R&D process with enough money to not have to pick and choose among untested ideas. This investment from the government will allow Abengoa Solar and Abound Solar Manufacturing to implement large solar installations, create some jobs along the way, and, yes, continue to improve solar energy as a viable alternative to petroleum. This is good news to blog about on Independence Day. Kudos to President Obama. 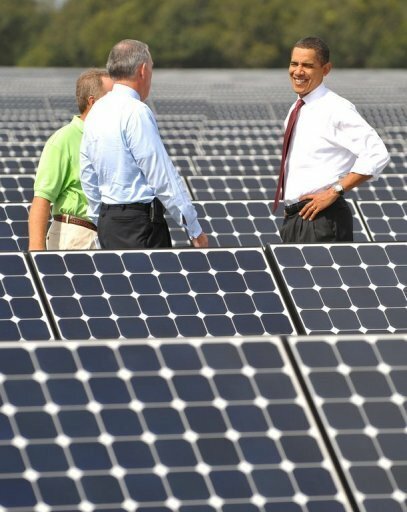 US President Barack Obama announced on Saturday the awarding of nearly two billion dollars to two solar energy companies that have agreed to build new power plants in the United States, creating thousands of new jobs. One of the companies, Abengoa Solar, has agreed to build one of the largest solar plants in the world in Arizona, which will create about 1,600 construction jobs. When completed, this plant will provide enough clean energy to power 70,000 homes. The other company, Abound Solar Manufacturing, is building two new plants, one in Colorado and one in Indiana. This seems like a week full of a lot of good solar efficiency news. As I’ve written many, many times (hit the solar link in the sidebar), solar power needs continued breakthroughs in two areas to become market-viable — costs must continue to come down and efficiency needs to continue to increase. This news out of UT Austin points toward potential very dramatic efficiency increases. Zhu and his colleagues report their results in this week’s Science. 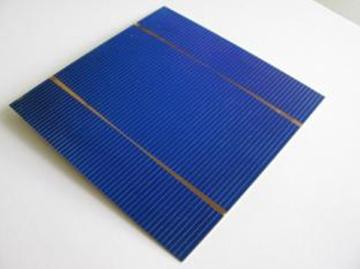 The maximum efficiency of the silicon solar cell in use today is about 31 percent. That’s because much of the energy from sunlight hitting a solar cell is too high to be turned into usable electricity. 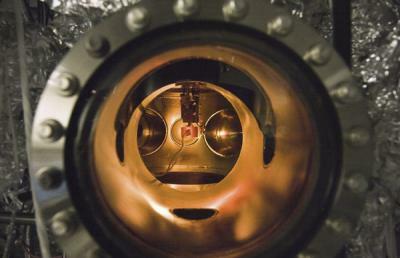 That energy, in the form of so-called “hot electrons,” is lost as heat. If you prefer the raw feed, here’s the release the linked story is based on. Impressive, over 20 percent energy conversion efficiency. The new N230 solar cell module is claimed to have an energy conversion efficiency of 20.7 percent, which makes it the most efficient solar module produced so far. The unprecedented efficiency was achieved by increasing the number of solar cell tabs from two to three and making each tab thinner. They also applied AG coated glass to the cells, and this reduces the amount of scattering and reflection of light. The increase in energy conversion efficiency could make the solar modules useful in areas with less than ideal amounts of sunshine. … has been solved by nanotech based on coaxial cable. Optically, the so-called nanocoax stands thick enough to capture light, yet its architecture makes it thin enough to allow a more efficient extraction of current, the researchers report in PSS’s Rapid Research Letters. This makes the nanocoax, invented at Boston College in 2005 and patented last year, a new platform for low cost, high efficiency solar power. A long-time space travel concept becomes reality. Japan’s IKAROS has rolled out its solar sail, the first ever deployed in space. 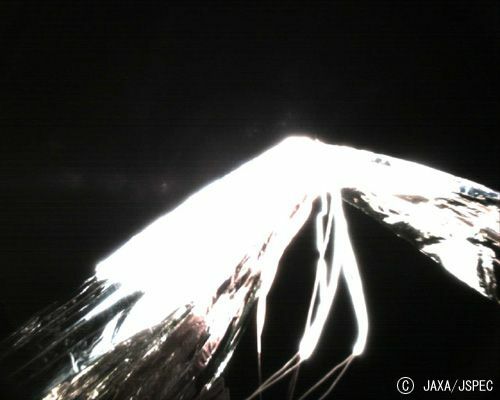 JAXA, the Japan Aerospace Exploration Agency, achieved the feat by rotating the craft rapidly and spinning the sail out by centrifugal force. IKAROS is the world’s first solar-powered spacecraft. Hit the link up there for more illustrations. “Imagine a foldable iPad,” said Benjamin Wiley, an assistant professor of chemistry at Duke. His team reports its findings online this week in Advanced Materials. … with “light pipes.” If this research bears fruit it will be a major solar breakthrough — drastically increased efficiency coupled with lower cost manufacturing. A win-win. Researchers in North Carolina have developed a way to more than double the performance of organic solar cells by adding a layer of upright optical fibers that act as sunlight traps. David Carroll, a professor of physics at Wake Forest University, led the development of a prototype solar cell incorporating the fibers. He is the chief scientist at a spinoff company called FiberCell that is developing a reel-to-reel manufacturing process to produce the cells. “We’re on the cusp of having working demonstrators that would convince someone to go into production with this,” said Carroll. The best organic solar cells today are nearly 8 percent efficient, although efforts are ongoing to develop organic chemistries that would push the efficiency of such cells above 10 percent. But Carroll says improved chemistries alone won’t be enough to catch up to the performance of silicon cells. “The answer doesn’t lie in chemistry–it lies in the architecture of the cell itself,” he says. Carroll adds that the dollar-per-watt cost of manufacturing fiber-based organic cells should be about the same cost as for flat organic cells. “But they can be produced in a factory costing one-tenth that of a silicon foundry,” he says. 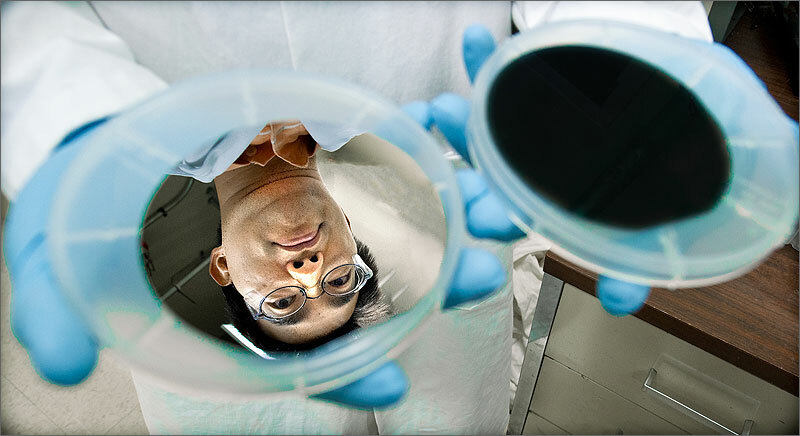 This would make them much cheaper to produce than silicon cells. Fiber forest: This prototype solar panel is covered with optical fibers. Photons bounce around inside the fibers before being absorbed, and this doubles the panel’s efficiency compared to regular organic cells. This is a somewhat surprising and actually interesting direction for solar efficiency research. Pokeberries – the weeds that children smash to stain their cheeks purple-red and that Civil War soldiers used to write letters home – could be the key to spreading solar power across the globe, according to researchers at Wake Forest University’s Center for Nanotechnology and Molecular Materials.